Destructor must be virtual because other methods are virtual. A class of functor objects whose purpose is to provide a generic interface between the read_* functions, below, and some container used to hold lines read. 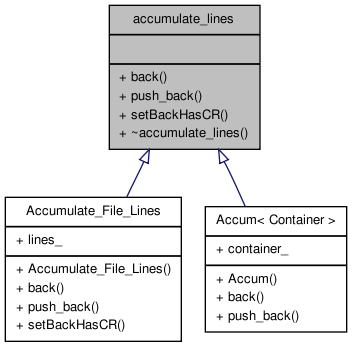 An accumulate_lines object has two virtual functions, push_back(), and back(). These let the read_lines function append new lines to the container and access the last line thereof when it needs to update it. See the read() template below for an example use. Definition at line 883 of file file.h. Definition at line 896 of file file.h. Implemented in Accumulate_File_Lines, and Accum< Container >.